An Unforgettable East Kimberley Experience. 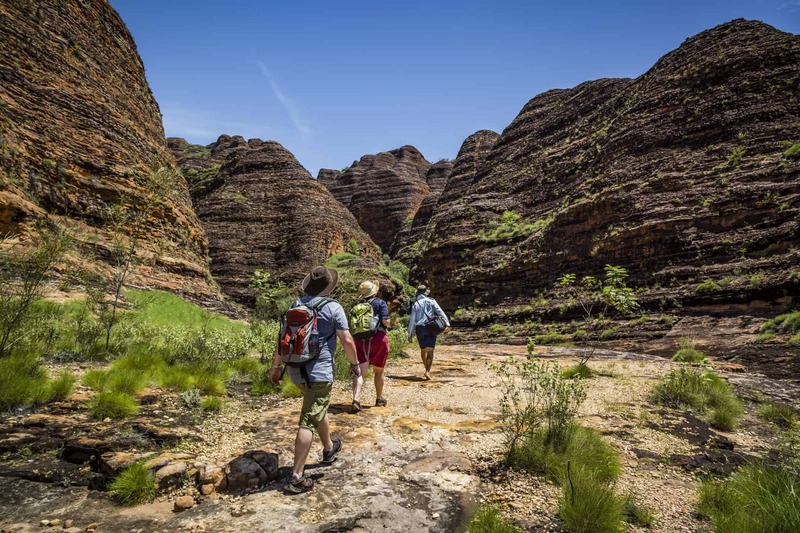 A ‘bucket list’ destination for every Kimberley itinerary, the World Heritage listed Purnululu National Park, home to the Bungle Bungle Range, offers an incomparable world class experience for adventurers of every age, ability, and budget. Boasting iconic geographic formations in one of the world’s most dramatic landscapes, a trip to the Bungle Bungle represents an awe-inspiring journey guaranteed to create a lifetime of memories. We love the Bungle Bungle for its abundance of unspoiled natural assets set against a backdrop of breathtaking wilderness beauty. Hidden from the world amid Purnululu National Park’s 240,000 hectares, Bungle Bungle is best appreciated with an overnight stay to really immerse yourself in your surrounds. The true hero of Purnululu National Park is one of the Kimberley’s best loved attractions, the incredible Bungle Bungle Range. Renowned for its striking orange and black striped sandstone domes that remained undiscovered until 1983, the Bungle Bungle Range is spectacular from both land and air. The Bungle Bungle delivers a fully immersive outdoor experience. Put on your hiking boots and book into a Bungle Bungle Guided Tour to ensure you don’t miss any hidden gems as you wander through the many gorges, chasms, and creek beds that carve their way through the wilderness. With easy and moderately graded tracks, you’ll discover canyons where sheer rock walls rise over two hundred meters, delight in the natural beauty of Livistona palms, and marvel at the surrounding landscape from scenic lookouts and beauty points. Bird spotters and flora and fauna enthusiasts will delight in the region’s abundant wildlife and native plants, with Purnululu National Park housing a profusion of different species. With much of Purnululu inaccessible by ground due to the fragility of its sandstone escarpments, a scenic helicopter or plane flight is a ‘must do’, and a great way to put into perspective the sheer size and scale of East Kimberley. 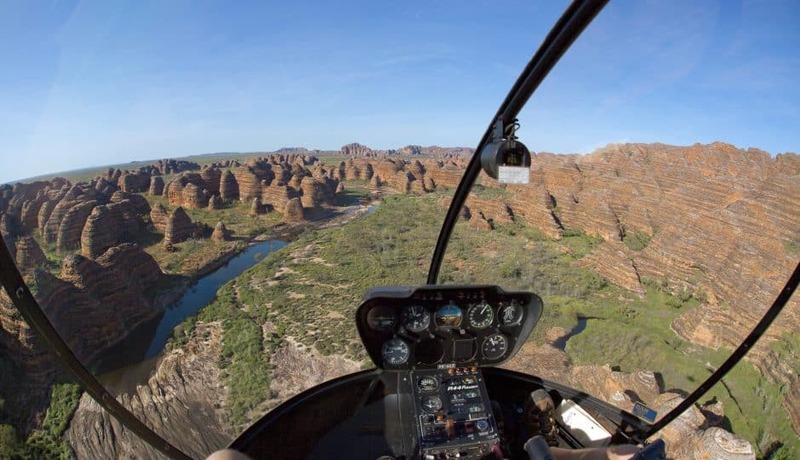 A helicopter flight allows visitors to get down low and close to the Bungle Bungle for amazing photo opportunities. You can catch a HeliSpirit flight from inside Purnululu National Park, or from Warmun if you’re not driving into the park. Flights are on offer from Kununurra all year round. The spectacular gorges and striped domes are one of nature’s greatest works of art – witness them from above to truly appreciate their beauty. If you take a scenic Aviair flight from Kununurra you’ll also get a chance to view Lake Argyle, the Argyle Diamond Mine, as well as mountain ranges, gorges, crevasses, and creek beds. It’s a uniquely memorable way to capture the essence of the East Kimberley. With ten different Bungle Bungle flying experiences to choose from, an Aviair tour offers passengers a combination of air and ground exploration. Make the most of your day by adding in a guided hike, 4WD tour, a heli-adventure, or an Ord River cruise. During Waterfall Season Purnululu National Park is only accessible by helicopter. Award-winning Bungle Bungle Guided Tours has exclusive access to guided walks, meaning you’ll have the whole park to yourself! Which tours and experiences will you add to your Bungle Bungle wish list? Explore below …..
Dry Season (April-September). In the waterfall season Bungle Bungle is inaccessible by road so take a HeliSpirit or Aviair Adventure flight for an unforgettable aerial view. Unsealed road with creek crossings, suited for high-clearance 4WDs. Only accessible by air with Bungle Bungle Guided Tours during the waterfall season. Only Single axle off road caravans/campers are allowed into the National Park. Contact the Bungles Visitors Centre for more information. https://parks.dpaw.wa.gov.au to find out about camping and entry fees for Purnululu National Park. Its remarkable natural assets, Bungle Bungle Range, unique range of tours and experiences, 40,000-year-old ancestral culture.